Permanent life insurance is designed to be in force for the policy holders lifetime to provide for a family and their assets. What happens when the policy owner outlives the maturity date on their policy? Things aren't like they used to be, people are living longer and life expectancies are increasing from what they were fifteen to twenty years ago. The World Health Organization projects the global number of centenarians to increase tenfold between 2010 and 2050. While most life policies written today protect people until the age 121, LIMRA's data reports that nearly 6 in 10 Americans have life insurance that was purchased over 15 years ago. The problem here is that policies written before 2004 protected those insured only to an average age of 95 or 100. There is a big gap between age 95 and 121! Mind the gap! 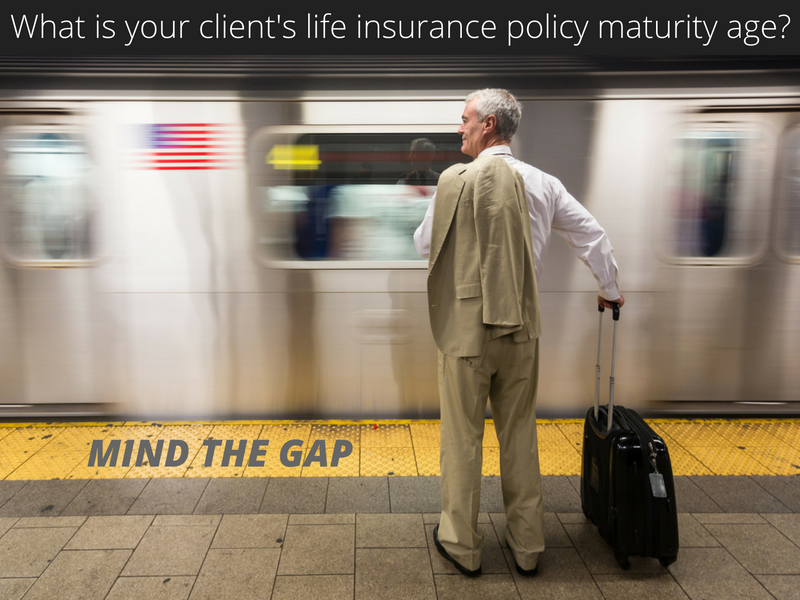 Don't let your client's policies mature before they need it the most. Protect your clients and their investment by reviewing their policies to ensure the policy maturity date matches their needs. The start of the year is an ideal time to sift through your book of business and perform reviews. Your clients will appreciate the timing and attention; this could be a great way of re-writing some of those outdated policies. Use our five steps as a guideline. Annual Policy Review - Look at the policy your client has, is it outdated? When is the maturity date? If your client reaches the maturity age will they be satisfied with the cash value and loss of death benefit. Not a great situation. It is the producer's responsibility to keep tabs on their clients policy and ensure it is performing as anticipated. Part of the policy review process includes assessing the performance, premiums and cash value, along with the time projected in force. Reviewing these elements of the existing policy will only help you to figure out if there are gaps that need to be filled or if a policy should be rewritten entirely. Client Review - Has the client's health and financial situation changed? Both will impact how you approach a new policy or change in policy. For example, if your client no longer needs the death benefit to cover estate taxes they may want to consider reducing the death benefit and adding a Long Term Care benefit. LTC is becoming a more relevant and beneficial benefit. What is your clients financial situation? Find out if they owe any loans, have outstanding debts or anticipate future expenses that will impact their lifestyle. There are calculators and tools available to conduct a full needs analysis to ensure an affordable premium and appropriate amount of protection. Goals of Your Client - What are their objectives for the future? When are they thinking of retiring? What lifestyle do they expect upon retiring? Who will be the beneficiary? Are they looking to transfer wealth or a business to the next generation? These questions, and answers, will determine your client's goals for a policy. Keep in mind, often these answers change as life changes. Logistics - How is your client's health? Can they obtain life insurance and if so is it affordable? Be sure to have a realistic approach and manage your client's expectations. Selection- Now that you know your client's existing policy, health status, what they can afford and what their objectives are, you can likely figure out their risk tolerance. Do they prefer a safer option with a guaranteed return, or taking a higher risk for a possibly larger return, but no guarantee? Once you know this you can narrow down the policy that is the best fit for them. Read InsuranceNewsNet Magazine's Life Insurance for a Lifetime Article for more on this topic. Speaking with your clients about their retirement and financial future will help to build relationships and secure their assets in retirement. Sign up to receive valuable news and tips from BSMG. Want to Grow your Business? we can help. Sign up to receive valuable news and tips from BSMG. © 2015 Brokers’ Service Marketing Group. All Rights Reserved.